Cheapest Wireless Display Dongle Found! I usually buy my gadgets at Sim Lim Square when I needed urgently. I also prefer shopping at Singapore online sites like Qoo10 or Lazada for prompt shipping. But some items are just so much cheaper to buy from overseas shopping sites that it is worth it. GearBest has become my favourite online shopping portal outside Singapore for gadgets, as some of their products are amazingly cheap compared to Aliexpress or Taobao. I was browsing through the catalog looking for great deals, and EasyCast OTA caught my eye. It is a HDMI dongle that uses the common wireless protocols like DLNA, Miracast, Airplay, EZAir to transmit videos and sound via Wi-Fi to the HDMI device. I have always wanted to get a wireless display dongle, but in earlier Android versions, the Miracast did not work that well. Google Chromecast is only for Android devices and has content mirroring limitations. When I saw how inexpensive GearBest was selling it (I bought it at about US$13), I thought it is a good price to test out and post my EasyCast OTA review. GearBest supports payment by PayPal, as well as major credit cards. Shipping is the most painful part, taking about 3 weeks to reach me. But well, I was prepared to wait. I was surprised at how easy it was for Android devices to be connected wirelessly. 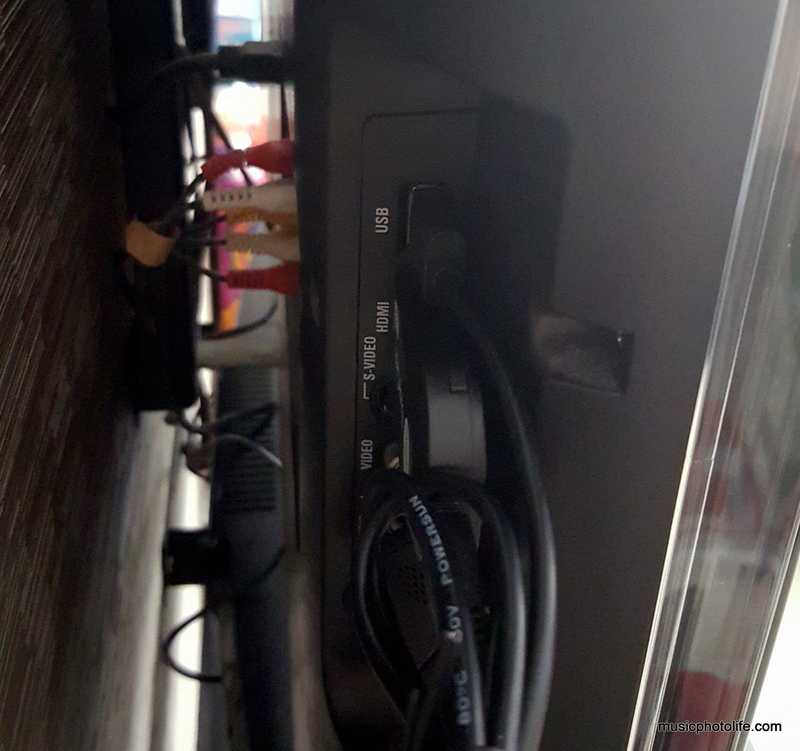 First, connect the EasyCast OTA to the TV HDMI port and plug it to a USB power source. Fortunately for me, the USB port is right next to the HDMI port. 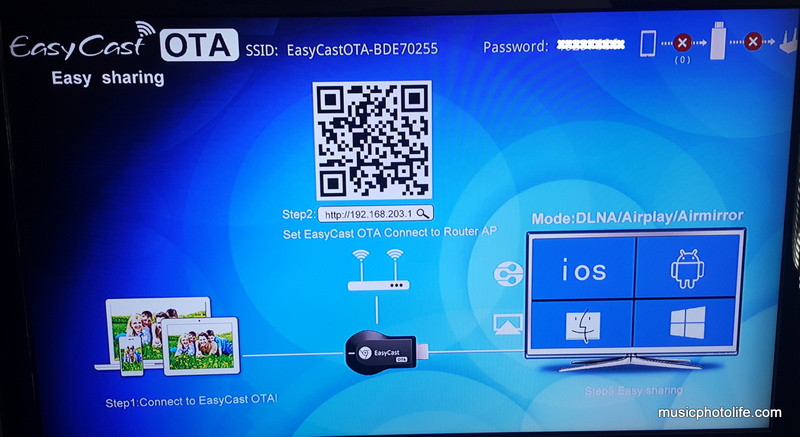 When you see the EasyCast OTA screen, press the button on the dongle to toggle to the type of connectivity that you want. Android is the easiest to connect: just go to the Android device and look for the wireless display menu setting under “Network/Wireless”. For newer Samsung devices like Galaxy S6 or Note 5, you can see “Quick Connect” from the notification menu. For older Samsung devices like Galaxy Note PRO, select “Screen Mirroring” under Settings – Connections. For ASUS Zenfone 2, look for “PlayTo” option under Settings – More. Once the connection is successful, your television will mirror the display and sound from your Android or iOS device. Resolution and frame rate is average with a slight acceptable lag which is expected of wireless display. With compatible apps like YouTube, you will see the option to select the Easy Cast OTA directly as a display source. Depending on your Android device, you can choose whether to mirror the display or to disable the Android display. 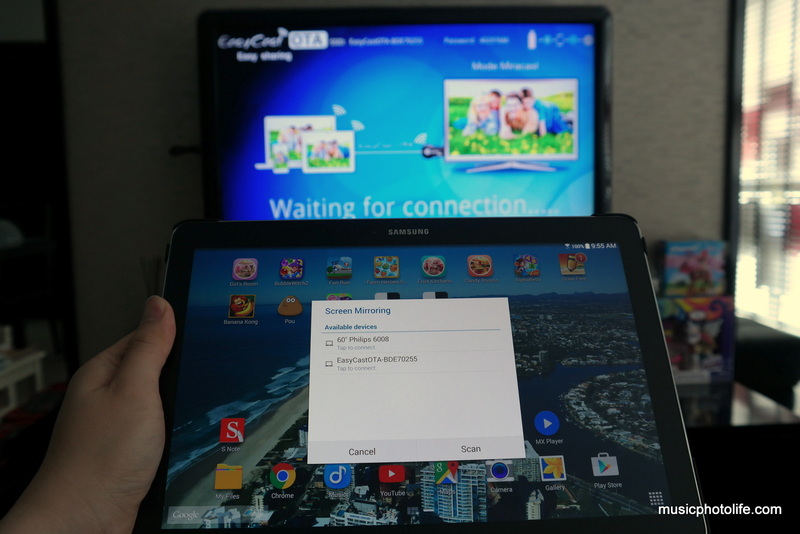 Devices with the latest Lollipop OS should also be able to connect to your wireless home network while using wireless display. If not, disconnect and reconnect. The Easy Cast OTA also supports DLNA, which is the standard for transmitting media over home network. This means you can also send music or video files from your iPhone, iPad, Windows or Mac to the television. Press the hardware button on the dongle to toggle the connectivity modes. The Easy Cast OTA is an inexpensive device for the occasional need to broadcast portable devices to the large TV screen. It supports a wide range of devices and OSes. Gearbest.com is probably the cheapest online store that sells this product, with free shipping worldwide. 3 Oct 2015: If you sign up ShopBack and click through to GearBest, ShopBack will give cashback for all purchases (read my review)! Do you know of another site that sells for cheaper? Or is there any other wireless display dongle which you feel offers better value? Let me know with your comments below. This article is not sponsored. The Gearbest.com URL (http://www.gearbest.com/networking-communication/pp_194421.html) links directly to the product page without any affiliate program tagged to me. 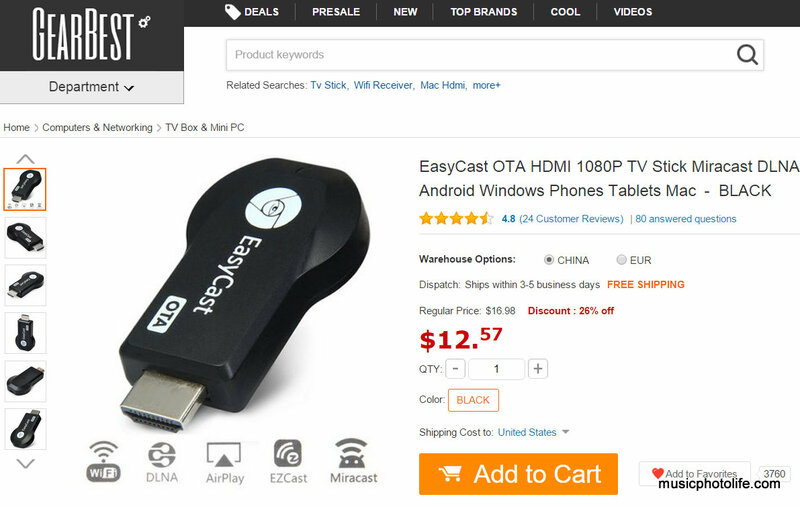 If for any reason the link is broken, visit Gearbest.com directly and search for “EasyCast OTA”. I am connecting with a chuwi vi8. I am not yet able to get past waiting for connection in both modes. I’ve noticed I am unable to connect to both WiFi and the ezicast at the same time. Hi Jason. Thanks for your sharing your issues. I don’t have much info on Chuwi but if VI8 has miracast then it should at least connect, though I suspect newer android versions might work better. Try to reboot both devices, and you should write to EasyCast support for further assistance. Is there any solution for your problem? It seems that now I have the same issue now. Hi, Nice review, very helpful. I have the same device, but for some reason, this system is not flawless, I mean, I tried it with iOS 9, from an iPad mini, also Android with a Lenovo K3 Note ( Android 5.0 ), and video playback is kind of choppy, definitely noticeable, sometimes the sound lags way behind the video, but it is perfect for displaying static content, like slideshows, pictures, websites, etc. Considering the price, it’s still nice. Thanks for your comments. Yes I do agree that streaming is not smooth at times. If it’s junk, then just say “it’s junk.” Makes it a lot easier on the consumer. First of all thank you for this nice review. I have an issue though. I can’t connect to my Samsung tv (also not to LG tv). Tried both Miracast and DLNA with no result. What am I doing wrong? Any suggestion? Hi Paul. Sorry to hear of your unfortunate experience. 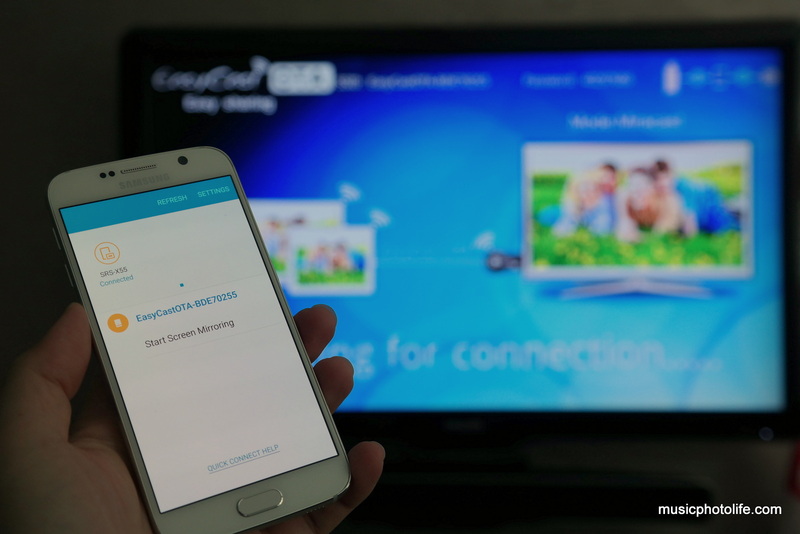 If the handheld device (smartphone, tablet, laptop) did not indicate that the mirroring is successfully connected to EasyCast, then the device has not established the connection. If all looks connected but still no display, I would suggest you send a trouble ticket to the purchase source for further resolution. Sorry to see that you can’t help me. hi can we mirror windows laptop to a hdmi projector with this? Yes if the Windows laptop supports WiDi (wireless display). I found another similar product – EasyCast 2.4G 5G WiFi Display Dongle. Not sure what is the difference in terms of mirroring smartphone screen to tv screen as compare with the OTA under review.. I believe the dongle you are referring to is the newer version where it also supports 5GHz band to improve coverage. I noted that the modern cars are installed with Head Unit that has hdmi port. By using the dongle, one should be able to mirror google map on the phone to the car display using airplay or miracast … is this the correct understanding ? If the car display unit can support standard HDMI input, then yes it is possible to mirror any external device to the car display via the dongle. Could you please assist in connecting the dongle with windows 7 ? Should I use any additional software and what to get it connetcted with the dongle? Hi, there is no need for additional software. You can connect using the Windows WiDi (Wireless Display) method and it should detect the dongle hardware. Hi Ian. The dongle is able to mirror everything from the Android device, including StarHub Go app content and any other app content. However, my experience shows that the streaming might not be extremely smooth, to manage your expectations. Hi! 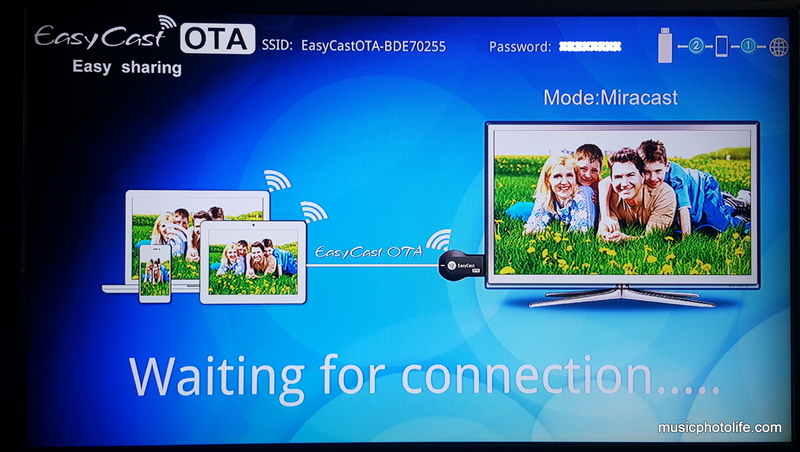 The EasyCast can mirror the entire display of the connected device to the TV. Just load the web browser on the device and it will mirror on the TV screen! EasyCast supports Windows, Android and Apple devices! I try mirror my laptop to TV in Miracast mode, after entering my password, but it didn’t work, the laptop screen ask for a pin # may be is not the password shows on my tv screen, I don’t have the pin #, can you help? Thanks. Hi! The password should be on the TV screen. 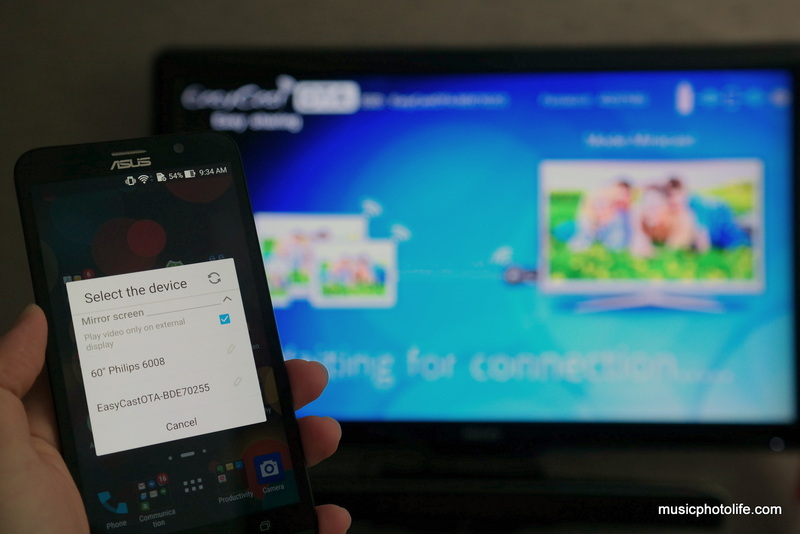 You might need to toggle the connection mode from Miracast to the other connect option. If it still doesn’t work, try to restart the Windows and reconnect. I own a RK2928 Anycast M2 PLUS chromecast miracast dongle DLNA Airplay Wi-Fi Display Miracast TV Dongle Multi-Display Receiver, after the update is no longer detected by the TV, why? Thank you. Is there a way to connect to the device with my Kindle Fire? This KF actually connect to both wireless (on the contrary of my PC) but it’s impossible to connect to the device to mirror scree. Maybe I need some kind of app? If you want cheap I got mine off Ebay got it within 3 day’s of ordering £11.99, slightly cheaper than the £30 chrome one..